This story came out about 2 weeks before Christmas 2013. This article (December 10, 2013) is about stress during the holidays. See below for Walmart's response to this. They say that the Holidays can be a stressful time. Dr. Wayne Dyer says that there is no such thing as stress, only stressful thoughts. Joe Cantrell was ad matching and went to a Walmart store in the valley. 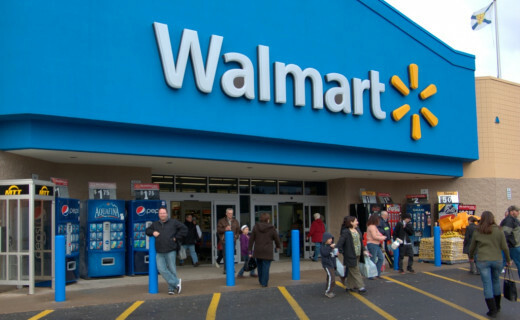 Some stores, like Walmart, will offer to match the lowest price that an item has advertised at any store. Comparing ads so you can do this, is ad matching. The valley area is in and around Phoenix, Arizona since it is in a valley. "When I left, he [Walmart employee] turned around and called the Pinal County Sheriff's Office and said he felt intimidated and threatened. I was upset, but never once did I say anything to the gentleman," Joe says of the incident. This video clip is less than 3 minutes long but says a lot. It tells about Joe Cantrell being a loyal Walmart shopper with him shopping there twice a day sometimes with his grandmother since Christmas is in 2 weeks. He does ad matching since every penny is important to him since he has retired from wrestling due to a disability. So the video clip is focusing on him getting arrested and taken away by police for ad matching that Walmart encourages. I live in the Valley so I saw the above news story first. He mentions how he cried at the police station and they let him go. We make every effort to make sure our customers have a good experience in our stores. As in previous situations, we attempted to work with this customer. However, in this situation, the associate felt unsafe and so we contacted local law enforcement. We are continuing to cooperate with law enforcement on their investigation. What started as a trip to a San Tan Valley Walmart to get ornaments for his family's Christmas tree, turned into the biggest nightmare of Joe's life. He said when he went back to Walmart four days later, three deputies handcuffed him, gave him a court summons and a notice banning him from any Walmart in the world for life. Joe wasn't arrested, but he said he's facing charges of threatening, intimidation and disorderly conduct. 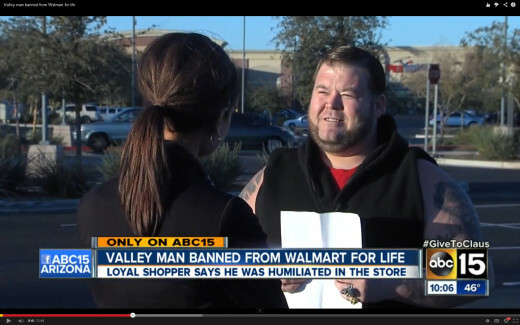 He has no attorney and he's still banned from Walmart for life. He does show the summons that says that he was arrested for intimidation and disorderly conduct. Since I am not a lawyer, I cannot give legal advice, so talk to a lawyer for legal advice. Say you are in a public place like a store and you yell at someone. Are you breaking the law? Disorderly conduct is a criminal charge in most jurisdictions in the United States. Typically, disorderly conduct makes it a crime to be drunk in public, to "disturb the peace", or to loiter in certain areas. Disturbing the peace is a crime generally defined as the unsettling of proper order in a public space through one's actions. 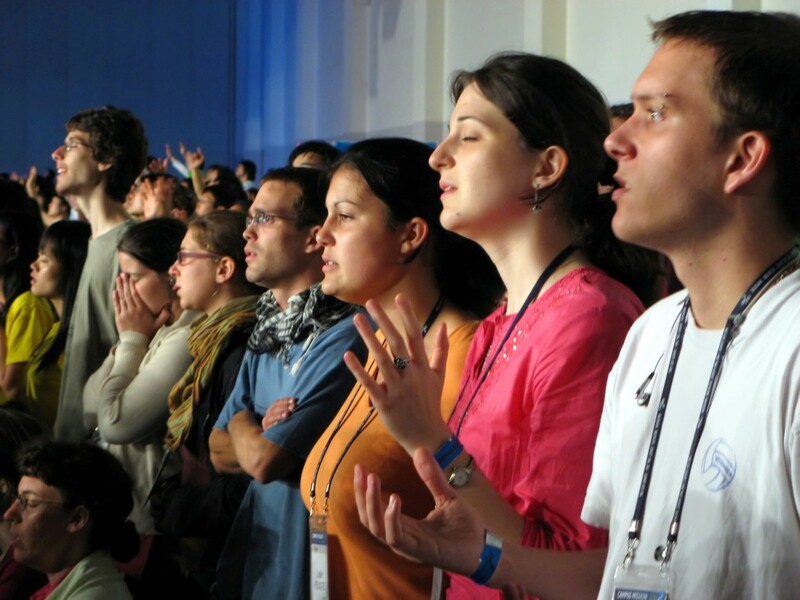 This can include creating loud noise by fighting or challenging to fight, disturbing others by loud and unreasonable noise (including loud music), or using offensive words. So back to the above story. Later I saw another news story on the above. I consider myself to be a very objective person. In this story it explains that Walmart clearly explains that ad matching has certain exceptions to it. They said that it was not in the fine print but easily seen so anyone can read what the exceptions are. So it sounds like he had one of these items and the Walmart employee was trying to explain that it did not apply to this item. So the ex-wrestler started crying and the employee felt bad so he gave it to him at the lower price. That is a joke. If that had happened, Joe Cantrell would not have been arrested but the employee could have been fired. So in the video clip above he acted very calm and pointed out that he cried in the police station. Also he sometimes shops with his grandmother and it showed him with his 2 little kids near the Christmas tree. Now I would guess that it is more likely for an ex-wrestler to get angry and intimidate an employee than for him to cry like he did at the police station. Now I do not know what happened but I know that Walmart knows that they have to careful of bad publicity. Also when dealing with people, they want more customers, not less customers. Some food stores have a policy that if an item scans for more that what it says that is, the store will give it to you for free. I have gotten many food items for free using this. One time I got a $7 food item for free and the employee was upset since even with her employee discount, she cannot get a $7 food item for free. What if the store does not have this policy. In this case you should mention to a manager or assistant manager that some stores have this policy about this so if he does not give it to you for free, then you will break his neck. Just kidding. You make sure to point out this with an attitude that you understand that he does not have to follow this. I have done this and have gotten items for free in stores that do not have this policy. In fact when talking to the manager, you should have the same demeanor (a person's appearance and behavior) as Joe Cantrell did in the news story above. One thing that you can do is drink nettle leaf tea. See 12 Health Benefits of Nettle Leaf Tea. Not only does this tea reduce stress and calm the nerves, it also nourishes the endocrine system glands like the adrenal glands. Adrenal glands can become overworked from stress. Make sure to get plenty of sleep. This also helps your immune system to avoid getting colds and the flu during the holidays. For more on this see Avoid Getting Colds and the Flu. Try to take your time and avoid rushing. There is a saying "Haste makes waste." Try not to put too much attention into the past or the future and try to enjoy the present moment. Exercise is good at reducing stress especially yoga. Someone with AIDS can say that they are dying. But everyone is dying. Each moment that you live is one moment closer to death. So it is better to spend that time relaxed than to be angry or stressed out. Also the consequences of getting angry or stressed out can be very bad as seen by the above. Also during the holidays (or any time), patience is a virtue. This is one of the 7 heavenly virtues. The others are chastity (purity), temperance (self-control), charity, diligence (like when comparing prices and quality do your due diligence), humility and kindness. The idea of karma is what you give is what you get. See video below about this. I guess if they catch him in there, they will call the police to arrest him for trespassing. Also at the hearing, the judge may tell him what will happen the next time he is caught in there. Interesting hub. How will Walmart implement the ban?